Product Details Sticks, stubs, thorns and horns make holes and tears in your PVC and vinyl gear. 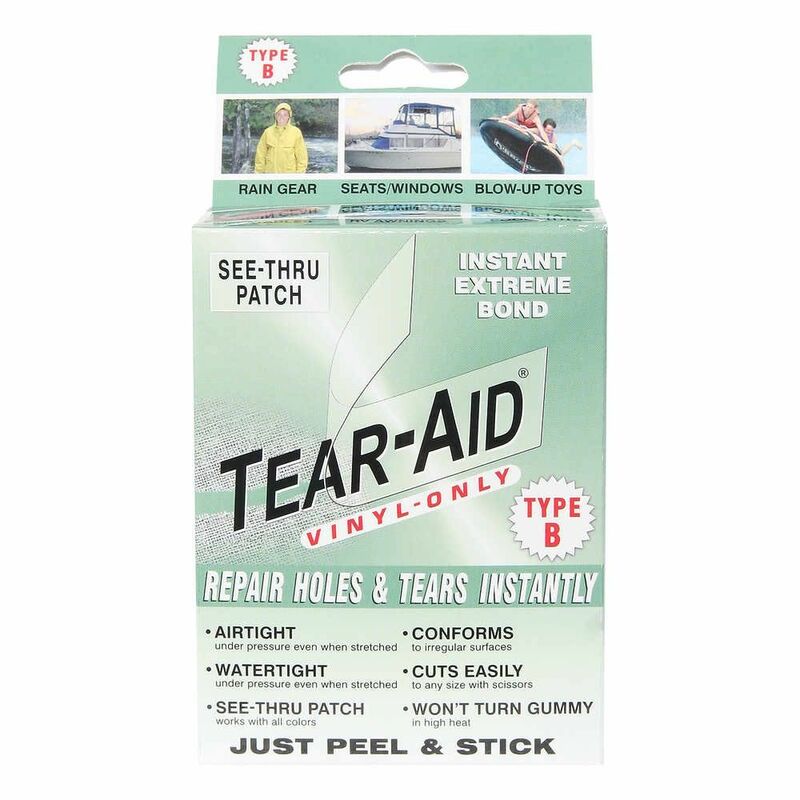 Tear-Aid Patch - Type B is your answer; It's durable, flexible, airtight and watertight. Perfect for your repair kit. The Tear-Aid Type B is for vinyl/PVC ONLY. The oils in these materials and coatings require the special adhesive in Type B. Patching is oh so easy. Select the right size patch for the job. Clean the repair surface with an alcohol prep pad or rubbing alcohol. When the area is dry, just peel the backing off the Tear-Aid patch and stick it on. No mess, no muss, no fuss. The unique adhesive on Type B resists the oils in vinyl that cause other adhesives to soften and turn gummy in sunlight. Available in kit form and in rolls 3"W x 5'L. Patches are airtight and watertight, even under pressure when stretched. The patches are see-through, so the color of your gear shows right through. It's UV resistant and conforms to irregular surfaces. 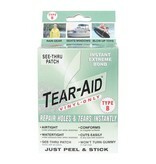 Don't throw away that gear - patch it with Tear-Aid. Patch dry bags, rain gear, air mattresses, water toys, luggage, raft seats, etc. The list is endless. Comes with complete, easy to follow directions - follow them carefully for the best results.